Businesses throughout the world are increasingly looking to streamline their operations and save money. Many businesses are experiencing tough financial situations and anything that can be done to reduce expenditure is extremely desirable. This is particularly the case if the alternative option also increases workforce efficiency. The concept of BYOD (bring your own device) involves employees bringing their own personal devices to the workplace. Many critics of this system point to the fact that employees will not be as efficient due to the availability of apps and other programs on their own device, security will be compromised and viruses could penetrate internal servers. However, users point to services such as cloud computing from Dell as a prime example of how safe the concept can be. When combined with a cloud computing service, BYOD can be the perfect solution to businesses of all sizes and Dell has even released a great infographic on the subject with plenty of useful information. A company with their own IT network and server will invariably have to purchase all the relevant hardware needed. In addition to this, they must employ a number of staff that can monitor the network and make changes when necessary. Maintenance costs can be relatively high when considered together with expenditure associated with amendments and customisation. Many companies expand their products and services or decide to go in a totally new direction altogether but this requires major alterations to an IT network, costing both time and money. The Cloud eliminates all of the above points by providing a secure system, maintenance free, and with numerous options for altering specific requirements when required. It is a well known fact that a happy workforce is a productive workforce. Recent reports suggest that businesses that have adopted a BYOD and Cloud computing combination have seen staff moral levels improve significantly. There is a sense of freedom when using your own device due to a certain familiarity. In addition to this, work can be completed outside of the office. Improved efficiency of a business’ workforce certainly improves the possibility of increasing profits and research claims 70% of businesses believe a BYOD model can improve productivity and profit when surveyed. 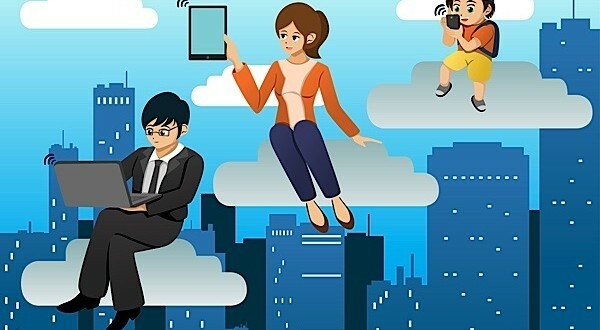 Should there be a situation where a personal device is lost, stolen or not working correctly, employees can simply switch to another device and access the Cloud platform as normal. There is no longer the requirement to update new devices, attempt to retrieve data or quickly get a device repaired – leading to numerous benefits for the business involved.